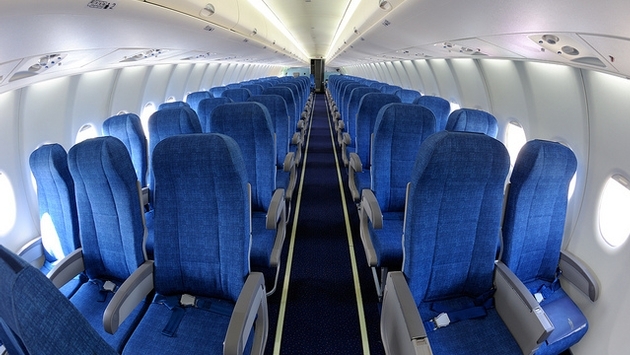 Sometimes passengers can actually benefit from an airline's mistake. One woman got an entire flight to herself after a recent rebooking mishap in Rochester, New York. Reddit user shadybaby22 shared her once-in-a-lifetime experience last week after snapping a selfie in front of several rows of empty seats on her flight from New York to Washington, D.C. The woman, identified only as Beth, said her solo journey occurred after her initial flight had been canceled. Staff rebooked passengers on a new flight but later informed them that they could board an earlier flight to D.C. However, Beth had already returned home to kill time and was never contacted about the flight change. "I was the only one in the waiting area 45 minutes before takeoff," she said. "One of the airport agents came over while I was waiting and asked if that was the flight I was waiting for then said 'I knew this would happen.'" The blunder wound up working in her in favor though as she was freed up to make the 200-mile jaunt in complete peace and serenity. The airline let Beth board despite the unusual circumstances since the aircraft and crew were needed in D.C. anyway. Beth said she settled into a seat close to the front of the plane and was presented with a brief safety demonstration. "It seemed far enough away that if the flight attendant was taking care of something in the front it wouldn't wake me up and close enough that if she had to tell me something she wouldn't have to shout or walk far." "Both captains and the flight attendant said they’ve never seen this happen before," she added. READ MORE: Is Your Flight About to be Canceled? Beth's post quickly went viral, racking up more than 130,000 up votes and 5,000 comments. Last year, a Scottish woman was the lone passenger on a Jet2 flight from Glasgow to Crete after two other passengers failed to show up.